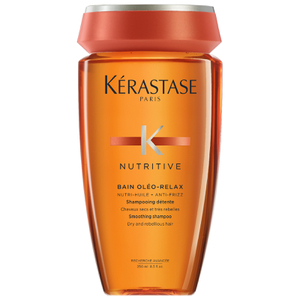 Kérastase Bain Oléo-Relax is a smoothing shampoo that disciplines dry, frizzy, unmanageable hair. It delivers, optimum nutrition, control and anti-frizz protection to leave hair soft and silky. Use the Kérastase Bain Oléo-Relax frequently and hair will benefit from improved softness and long-lasting volume and control. Micro-Emulsion Technology (patented): Formulated with our latest generation of oils and silicones reduced to micronised particles, coats the hair with an ultra-fine film. Anti-Frizz Protection Formula: Soluble Silicone Derivatives provide a long-lasting anti-frizz effect on particularly dry and uncontrollable hair.